Easter candy doesn't have to be limited to store-bought jelly beans and chocolate rabbits. With a little time and a few common ingredients, you can make a wide variety of delicious, beautiful Easter egg candies. Whether you like your Easter eggs full of chocolate, nuts, coconut, or all of the above, there's an Easter egg recipe here that's sure to please. Creme Eggs are just like your favorite store-bought Easter eggs! These creamy white fondant candies have a surprise inside their chocolate-dipped shell: a beautiful yellow "yolk." The basic recipe produces a mild vanilla-flavored egg, but you can use different extracts or flavorings to suit your tastes. Solid Chocolate Easter Eggs are beautiful edible gifts that can be made without any special equipment. Eggshells are hollowed out and used as candy molds to produce these easy, delicious Easter candies. Here's your chance to learn how to make your own gorgeous hollow chocolate egg! Fill these edible eggs with candies, toys, love notes, or anything else you can think of! 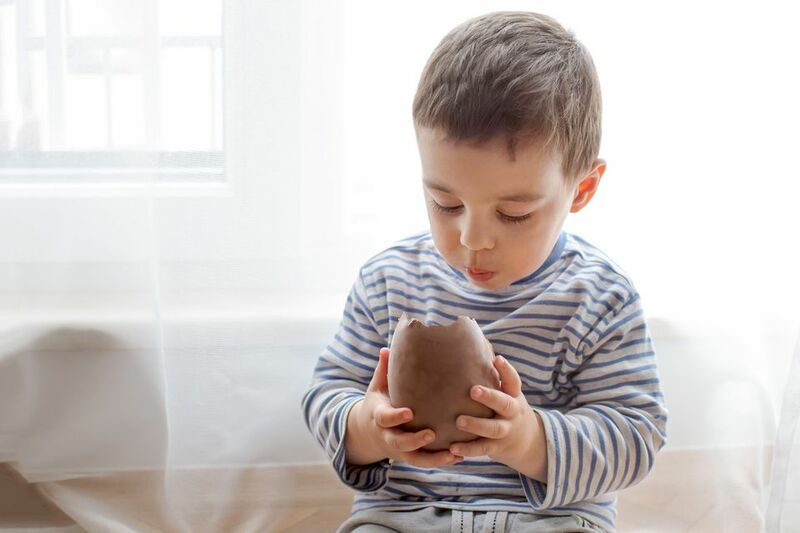 A homemade chocolate egg makes a wonderful, thoughtful Easter gift. Chocolate and peanut butter are a natural flavor combination that shines in this festive recipe. Cream cheese adds a subtle tang and helps keep the eggs from becoming cloyingly sweet. Make your Easter sweeter with these Easter Egg Cake Pops! Moist bites of cake and frosting are formed into egg shapes, made into lollipops, and decorated to look like festive Easter eggs. Deep Fried Easter Crème Eggs are a deadly--and delicious--Easter treat! The popular chocolate-coated eggs with the liquid creme filling are dipped in a quick batter, then deep-fried to golden perfection. The outside is crispy while the inside melts into a sweet, gooey chocolate-and-creme puddle. 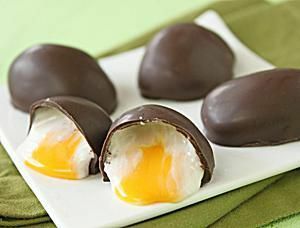 Unlike the creme eggs above, these chocolate-covered Fondant Eggs don't liquefy, and the recipe is a bit easier to throw together, so they're perfect for when you're pressed for time, or making candy with young helpers. They still have a great vanilla cream taste, and they also have the signature yellow "yolk" encased in a white filling! Shredded coconut is paired with tangy cream cheese in these easy, delicious Coconut Easter Eggs. To prevent these eggs from becoming too sweet, I recommend using unsweetened coconut and adding a generous pinch of salt. Sugar eggs are a fun Easter craft activity, and the resulting product is a gorgeous keepsake that can be saved and displayed for many years. Don't miss the photo tutorial showing how to make Panoramic Sugar Easter Eggs!